OBSOLETE - NOT AVAILABLE ! Often I have to be very creative: pull used parts form similar equipment, custom modify or even custom fabricate. Thus: forget manufacturer replacment part numbers. Foremost I need ONE (only one please!) detail PHOTO form you, for each part that you need - plus the details form below (1-5)! To review your materials and then to search the part and to create a photo back to you takes: a lot of time! To be exact: my work time that I need to bill for at my regular shop rate, as time spent answering parts inquiries is time not spent on my work bench. Thus: $30 minimum for the first part. So: If you can find the needed part some place elese, please by all means do all you can, to do so! And: BEFORE contacting me! I allow for parts inquiries only, because: I myself know first hand how frustrating it is not to be able to find them - to help YOU out, so: I do need to bill for ALL of my time spent with your parts inquiry and at my regular shop rate. Other than that: Glad to help! And: THANK YOU! CUSTOM ORDER ITEMS, that is anything that requires direct interaction - are $30 minimum for the first item. No parts inquiries answered over the telephone -> submit by e-mail only! -> SHOOT in macro mode, so that the camera will focus properly! 2) Please re-size the image in your camera to the smallest image size or use an image editing program for a file size smaller than 100 Kb, or I will not be able to review - No response! 3) Any additional descriptive information, such as: 3A): what the part is, what it's function is - where AND how it is used; 3B): values (example: capacitors, potentiometers, transformers, semi conductors, etc: K Ohms, uF , voltages, current requirements, etc. AND: physical dimensions (in inches or millimeters) - especially important for belts! 3D): type: for example "square" or "round"
5) Please care to include your ship-to ZIP code for accurate shipping costs. No parts inquiries answered over the telephone. I will e-mail you one photo of parts that potentially may work, to offer purchase options, or for discussion if nothing closely matching is available - BUT: After sending you the first photo / e-mail I require a non refundable $25 deposit to compensate for my work time, before further materials can be e-mailed to you. 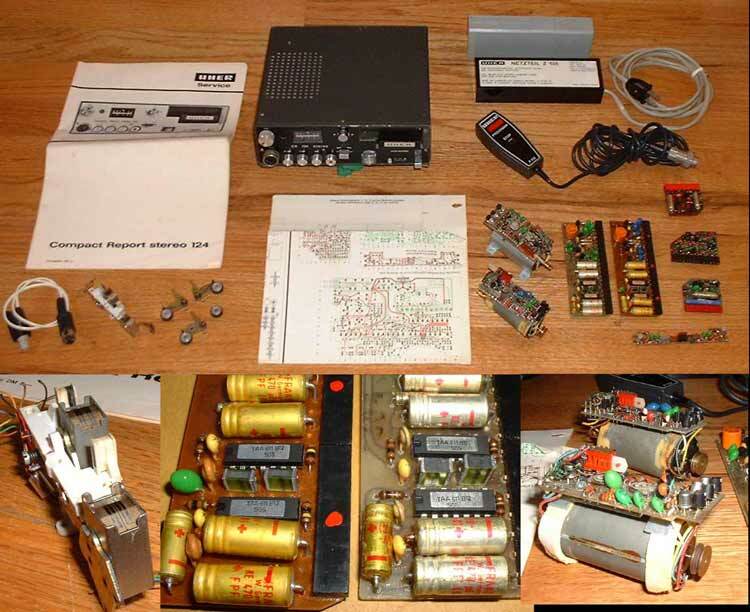 NOTE: Due to the nature of obsolete vintage audio equipment and its obsolete parts: There are NO warranties expressed or implied, that I may be able to help, nor that I have or can provide the needed part, nor that parts that I may have, will work. What the processing fee pays for, is for my time only, to review your materials, search my stock, equipment, or parts sources, and to answer your inquiry. Although: All of my efforts will focus to aid to the best extent possible for a soltion to provide parts to get your equipment working again! - Proud of 30 years of experience! AND: with those who are paying for my time I may gladly share any information that I may have, including where to potentially find it or how to substitute, if I dont have it. Alternatives: browse my web site and simply purchase available items via the Paypal shopping cart on my web site. Or: If I get enough inquiries for items that I have readliy available or easily can provide, I may in response to your inquiry make these items available to the shopping cart, saving you the processing fee.  Parts ready to Purchase / Listed parts -> SEE BELOW!  Technical Questions -How to: find, name, substitue, repair etc. Parts are available for below listed machines. Each describes what parts are available and which are not. 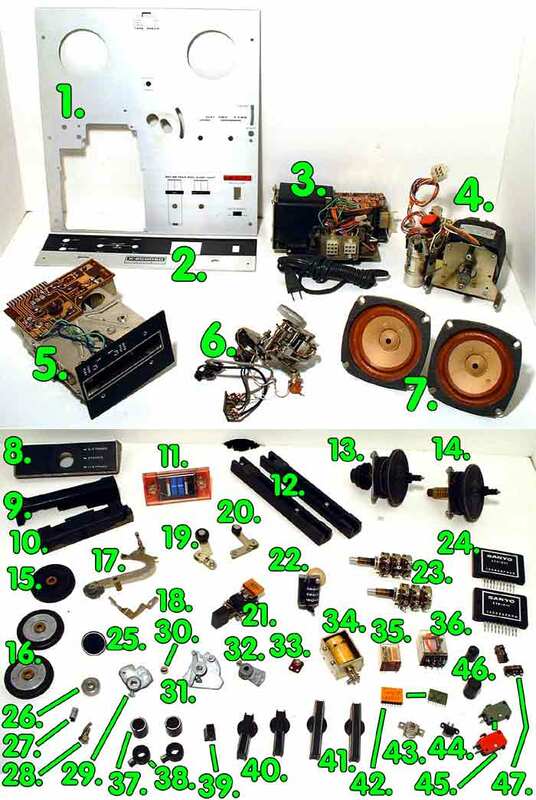 All parts for these machines are used pulled quality parts in good and working condition, if not noted otherwise . Some parts, such as knobs, may be compatible with several models. Please check for simmilar models. Machines not shown here are not avilable . For most parts, please inquire by description. I will give you availability information, a quote for the parts you need, plus order and payment information. Please care to include your ship-to ZIP code, so that I may calculate your shipping charges for the total of your order. $25.00 Minimum Order for items not listed in the Paypal shopping cart system - Great discounts apply and packakge deals given for the purchase of several parts. Organ Keys + Piano Action Parts have moved to HERE! 7" Reel to Reel Recorder AND 8 Track cartridge recorder. SALE --- $9.99 each !. Pretty much ALL Parts avail. Actuator levers "pot metal" parts HERE!. Pitch Conversion Sleeve HERE!. INQUIRE by description. I even have a the lid for the woden case! Combination unit: 7" Reel to Reel Recorder, 8 Track cartridge and Compact Cassette recorders. Large Detail Picture -Click here! Payment links will be deleted as parts sell.- Page is current as to what is avaialable. Substantial discounts will be given, if buying more than 1 part. Discounted prices for 10-50% off. The more parts you buy in one order, the deeper the discount! Discount will be refunded after payment has been made at regular prices if purchasign with the shopping cart as below. If wanting to know totals / discount before purchasing, please inquire for the needed parts. Will respond with a total including discounts and shipping charges. After you okay the order I will send invoice with payment instructions. All parts used in good condition, Machine was tested before the machine was parted out. Foreign buyers please inquire: The paypal shopping cart likely miscalculates the shipping charges. Please do not purcase with the shopping cart, as likely I will have to make adjustments before I can ship - instead: Inquire to purchase! 7. AKAI X-2000SD Speakers. size: 4" , removed form AKAI X-200SD, but also will work in other AKAI amplified tape machines, such as the X-1800SD. Used. Signs of age and use. 2 availalbe, sold as 1 each. $ 15.00 SOLD OUT! 12. SOLD! No longer available. 13. AKAI X-2000SD Suppy reel hub assembly - complete, This is the complete assebly to which the supply reel would be mounted. has: tape reel lock,, o-ring, clutch, mounting plate and rear pulley; This would be mounted on th erignt side of the tape deck. 1 availalbe. $ 35.00 SOLD OUT! 14. AKAI X-2000SD Take-Up reel hub assembly - complete, This is the complete assebly to which the take-up reel would be mounted. has: tape reel lock,, wind surface, clutch, and the mounting ; This would be mounted on left hand side of the tape deck. 1 availalbe. $ 35.00 SOLD OUT! 15. AKAI X-2000SD Transfer Idler wheel, Solid black plastic, drive surface rifled, brass center bushing 2 availalbe (only 1 shown), This pasrt is used in a variety of single motor AKAI decks, such as the X-1800SD or the 1700W and other models; sold: 1 each. $ 12.00 ea. 16. AKAI X-2000SD Idler weel, used for winding fuctions of the reel to reel section, Solid allimunium, drive edge rubber coated, brass center bushing 4 availalbe (only 2 shown), This pasrt is used in a variety of single motor AKAI decks, such as the X-1800SD or the 1700W and more models; sold: 1 each. For the rounded 2 pin AC connector as shown above - used in Ampex 1250 machines, or 620 + 2010 speakers and other vintage Ampex gear. Used, tested, compatible. Type, length and color may varry. Please Check above photo for compatibilty with your machine! Purchase This cable, or other odd, hard to find or obsolete Power chords / AC cables and connectors HERE! 17. AKAI X-2000SD Tape End Sensor w/ tape guide, used to sense when the tape is at an end, and it operates a microshwitch to turn the machine of. You may have to replace yours if bent. This one is in excellent condition and sraight. 1 availalbe. 18. AKAI X-2000SD Tape Lifter w/ tape guide, used to lift the tape from the heads when the machine is winding to prevent unnecessary head wear. You may have to replace yours if bent. This one is sraight. 1 available. 19. AKAI X-2000SD Reel brake arm with rubber pad, used to brake the tape reel after winding functions. Unfortunately I do not rmemeber which goes on which side. Look at your machine to identify the part you need. Some wear, but works well. 1 available. 20. AKAI X-2000SD Reel brake arm with rubber pad, used to brake the tape reel after winding functions. Unfortunately I do not rmemeber which goes on which side. Look at your machine to identify the part you need. Some wear, but works well. 1 available. 21. AKAI X-2000SD Power Switch, Main power switch, includes: 0.039 uF + 120 Ohm 500V integrated capacitor, and it includes the push button (as shown). 1 availalbe. 22. AKAI X-2000SD Tape Counter, 4 digit with reset button, 1 available. 27. AKAI X-2000SD Pitch Conversion sleeve. This is the famous highly saught after pitch conversion sleeve, which alwyas seem to have gotten lost on many AKAI recorders. This part allows to change operating speeds of the reel to reel deck from 3 3/4 IPS to 7 1/2 IPS. Used by many AKAI models including the X-1800SD, 1700, and compatible with almost all machines that use conversion sleeves. Only 1 availalbe - Get it before someone else will! 29. AKAI X-2000SD Pot Metal Cam - Play/Stop. This part is commonly also referred to as: pot metal parts, bearings , engagement lever/shaft boss, cast puter part, bushing, or aluminum rocker part, that is on the shaft of the knob. This particular part is the primary cam for the play lever. On many AKAI machines this part gets brittle and eventually shatters leaving the machine unoperable. Many people had to junk their AKAI decks due to parts obsolete, and as this part fails on about 50% of the machines, it is highly saught after. Only 1 availalbe - get it before some one else will! These parts are geting scarce. Dicounted pricing offered when ordering more than 1 part - see top of X-200SD. 30. AKAI X-2000SD Steel Ball. This steel baal sitts between the 2 operatign lever cams and prevents that more than one function is operated at one time. Dicounted pricing offered when ordering more than 1 part - see top of X-200SD. 31. AKAI X-2000SD Pot Metal Cam - FF/REW. This part is commonly also referred to as: pot metal parts, bearings , engagement lever/shaft boss, cast puter part, bushing, or aluminum rocker part, that is on the shaft of the knob. This particular part is the primary cam for the fast forward / rewind lever. On many AKAI machines this part gets brittle and eventually shatters leaving the machine unoperable. Many people had to junk their AKAI decks due to parts obsolet. As this part fails on about 50% of the machines, it is highly saught after. Only 1 availalbe - get it before some one else will! These parts are geting scarce. Dicounted pricing offered when ordering more than 1 part - see top of X-200SD. 32. AKAI X-2000SD Pot Metal Cam - Secondary. This part is commonly also referred to as: pot metal parts, bearings , engagement lever/shaft boss, cast puter part, bushing, or aluminum rocker part, that is on the shaft of the knob. This particular part is the secodary cam. On many AKAI machines this part gets brittle and eventually shatters leaving the machine unoperable. Many people had to junk their AKAI decks due to parts obsolet. As this part fails on about 50% of the machines, it is highly saught after. Only 1 availalbe - get it before some one else will! These parts are geting scarce. Dicounted pricing offered when ordering more than 1 part - see top of X-200SD. 41. AKAI X-2000SD LEVER, Reel to Reel This is the the lever that operates functions on the Reel to Reel deck. Mounting would fit other single motor AKAI decks, such as th eX-1800SD, but would look different. Solid body alluminum with set screw, black, slight corrosion (visible only upon close inspection) otherwise good, 2 available, sold as: 1 each. @ $ 28.00 ea. SOLD OUT! 42. AKAI X-2000SD Integrated Circuit: AA072. This is the custom integrated circuit (likely comprised of capacitors and resostors), made by Taiyo and is labeled as: AA072 with a number on back of: 5404-N, 2 available (each looks different: organge plastic case, or: dipped green - specify which one you want, was located on the main amplifier PCB, sold as: 1 each. @ $ 18.00 ea. SOLD OUT! 46. AKAI X-2000SD Coils. Due to space limitations 2 items combined into 1 order number. These are both coils, where the upper is a 2 connector coil (marked with 333 - order number 46A) and the other is the bias oscillator coil (multiple pins - order number #46B) 1 avaailalbe each, sold as: 1 each. @ ea. Professional 10" Reel to Reel Recorder - Solid State. -Not available: Any parts. Only a xerox copy of the complete service manual for this machine - pages somewhat out of order (as not numbered), but complete and includes model descriptions, factory history, module schematics and allignement precedures. Stereo Open Reel Recorder w/ auto reverse. -Available: Amplifier module - working stadn alone - great outboards gear! (Need a vintage Mic-Pre? - View this unit HERE!) Power Transformer: FR-210 / 56152-2, Drive Motor w/ spare conversion pulley, capstan flywheel, complete head assembly with play lever, Control relay PCB (3 relays on it), bias oscillator PCB, Main solenoid, head cover upper, head cover lower, 1 rubber reel fastener, tape hub drive assemblies, 2 rubber tape hub covers, The wooden case (good cond.) and the faceplate / Front Pannel. I have a photo of all parts, please inquire. -Not available: Any other parts than listed above. Propriotory stereo tape cartridge reording and palyback system, tube amplified. -Not available: Any parts other than the main motor. 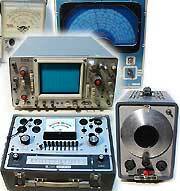 -Available: Face plate, knobs, buttons, meters, different PCBs and modules, Transformer, etc. Knobs / Buttons will work for many of the 22XX series (2230, 2250, 2265, 2260 etc.). The knobs are shown here: here For other parts please inquire. A larger JPG of Pedal Tops here! 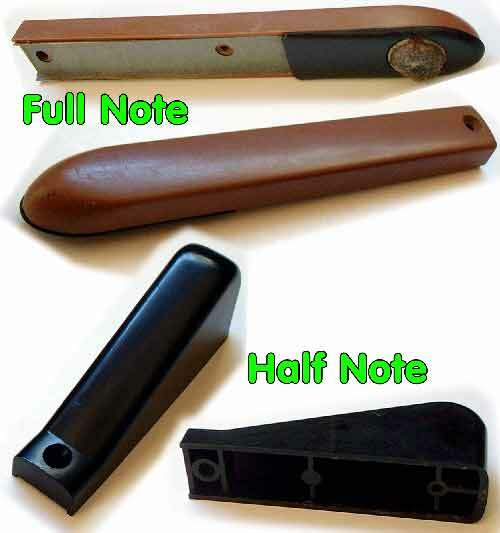 Full Note (brown) $15.00 ea. Half Note (black) $12.00 ea..
PACKAGE DEALS or DISCOUNTS given, when buying several items. (If using the shoppong cart I will refund the amount for yoru discount). You are welcome to make offers with your inquiries as well, but I reserve the right to kindly refuse, or to ignore your inquiry, if unreasonable. It takes tremendouds time take machines in good condition apart, to maintian web and inventory. Please consider that I provide obsolete parts services in the frame work of making a living. Turn Tables: > Turntable Belts and more Parts! The dust cover includes removable springloaded mounting hinges and it shoud not be very hard to modify it to fit different turntables. -Available: Platter, rubber mat, Motor, Pitch adjustment knob, pitch adjustment belt,, counter weight, Chassis to case mounting springs (used in many Dual models!). Many of the here listed parts are compatible with other simmilar models. -Not vailable: All not listed above. Please do not inquire for unavailable parts. -Available: Motor (w. pulley and all mounting hardware), Motor cover (black plastic part - insert at bottom plate; Mechanical actuator plastic parts with ball bearing; Arm return gear w/ mounting screws (complete. ); All push buttons (with black mechanical plastic parts attached to them, Platter bearing (includes the platter mounting shaft; power switch assembly w/ mounting hardware; rubber feet (each or the set of 4); Complete tone arm assembly w/ arm rest, all mechanical parts, wiring (This tone arm assembly is a complete case cut-out and includes the complete plastic cut from the case and the arm bearing. (Inquire for photots if unclear!) This assembly can be used to build a turntable from scratch as the arm is complete with anything imaginable (tone arm includes the counter weigth, the head shell, the wiring, but does not include a cartridge. -Not vailable: Platter, Platter ruber and all not listed above. Please do not inquire for unavailable parts. -Available: Owners Manual, Service Manual w/parts list, 45 RPM changer adapter w/ mounting hardware, 3 extra stylie. inquire fro what you need form the above. 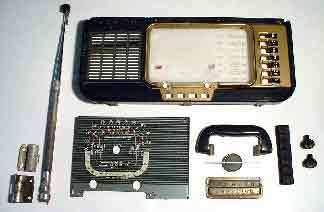 -Not available: Any of the wooden case parts, wave magnet antenna. 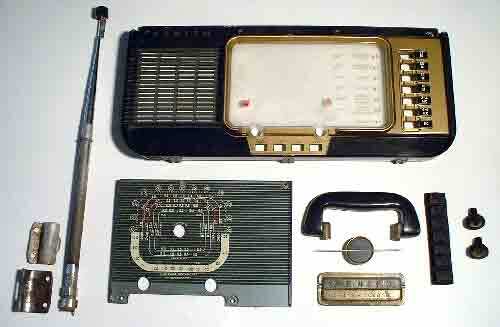 Faceplate, handle, knobs, brass, antenna - have sold! -Available:: Dial indicator plate, dial pointer, speaker (#343302 / 40CZ668), trannsformer (#66839), chasis and electronic parts, battery to chasis connector. All other parts not availalbe. A JPG of available parts here! Please note, that most parts have sold, see above!